Newsrooms around the country have been unionizing at rates not seen for decades — but they’re not doing it by tabling outside printing presses or handing out leaflets. Like so much else, organizing has gone digital. Unions have become the latest battleground in the fight for the well-being of journalists as their jobs become more demanding and newsrooms continue to downsize their staff. Digital tools like social media have played a key role in organizing efforts, allowing union members to quickly share messages and rally support among their colleagues. But those same tools can also be used to spread counter messaging, discourage journalists from joining a guild and threaten months of planning with a single blog post revealing a union’s plans. Over the past year, newsrooms at the Los Angeles Times, Chicago Tribune, The Florida Times Union and other newspapers organized more than 300 writers, photographers and staff under the umbrella of Communications Workers of America’s union of journalists known as the News Guild. Digital news outlets like Vice Media, Vox Media, Gawker and Fusion, meanwhile, have largely sought representation from the Writers Guild of America, the News Guild’s main national competitor. Journalists cited a number of reasons as driving forces behind their decision to organize: the erosion of benefits, such as health care, job security and alarm over what several Latino journalists described as a lack of diversity in their newsrooms. “[Unionizing] was the only way to have some power,” said Carolina Miranda, a columnist at the Los Angeles Times and co-chair of the L.A. Times Guild. Both organizing efforts at the Chicago Tribune and The Los Angeles Times started off as in-person, discrete conversations among journalists — in part to keep a low-profile and not tip-off management about their efforts. Though retaliating against employees for union activities is illegal in several states, many journalists said they had worries of potential backlash that could cost them their jobs. In October 2016, as journalists at Fusion prepared to form a guild of their own, Fusion management sent an email to the staff where it makes an attempt to discourage those planning to unionize, according to Buzzfeed News. The message attempted to convince some staff members to oppose forming a union by arguing whether they wanted to join or not, they would be represented by the union during collective bargaining. Organizing online, using social media to spread messages and recruit members, has also opened up newsrooms to the possibility that management may know about their efforts before they’re ready to announce. In April, Robert Feder, a blogger who covers Chicago media, published a letter that was sent to employees of The Chicago Tribune. In it, the 46 Tribune employees that banded together to form the Chicago Tribune Guild explained their plans to unionize. Organizers worried about the fallout since the entire campaign was just days from going public. Ultimately, though, the letter did not jeopardize any organizing efforts. The Chicago Tribune Guild, comprised of more than 300 members as of July, has yet to draft a union contract, but Ramirez said by unionizing they will “advocate for everyone in the institution for pay increases and better working conditions”. Chicago Tribune employees have not seen a single pay increase since 2016. Yet, executives like Michael Ferro Jr., the former chairman of Tronc, will have pocketed over $5 million a year in consultation fees through another one of his companies until 2020. During our union drive, some people were worried that there wasn’t enough money for raises, and that there was a limited pool of money in the newsroom that we’d all be fighting over. And today we learn that meanwhile, we were making the company tens in millions in profits. Newsroom unionization first took off in the early 1930s after The New Republic columnist Heywood Broun organized journalists who were affected by the Great Depression. Over the past year, unions across industries have seen membership decrease nationally. The number of American workers covered by union contracts has dropped from 17 percent in 1987 to 12 percent in 2017. Newsroom unionization, however, has been on the rise, led by widespread unionization among digital outlets. Media companies like Vox Media, Vice Media, Huffington Post and Fusion are now among the newsrooms represented by the Writers Guild of America, East. At newspapers and other traditional-media newsrooms, efforts to unionize have been driven largely by younger journalists, who never worked in a media landscape that promised job security, high wages or market-rate retirement benefits. They’ve seen their colleagues laid off and bought out, and watched as since the Great Recession newsrooms have downsized and constricted. 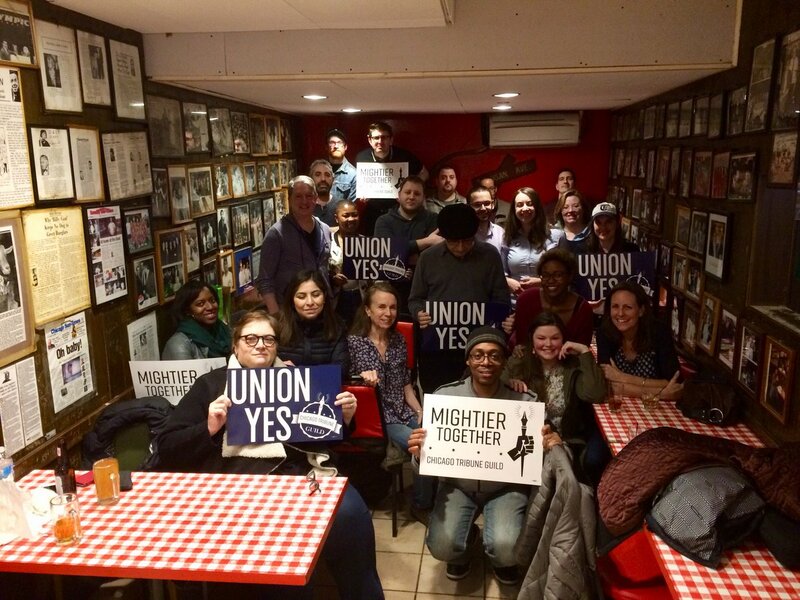 These young new members also leveraged social media in ways union organizers of years past could not have. They created memes, hashtags, awareness campaigns. One such effort —a meme featuring the antagonistic Nurse Ratched from the film, “One Flew Over The Cuckoo’s Nest” — served to remind Los Angeles Times guild members to turn in a survey about healthcare benefits. The lack of journalists from diverse ethnicities, sexual orientations, cultures and genders drives the unions to demand that diversity be a priority in their list of demands. Not only do they feel that hiring journalists from diversity backgrounds makes their publication much more accurate but it also widens the net as far as who can read and who is covered in their publication. Not all newsrooms have included diversity as a tenet of their union contract, however. Though many newsroom unions are still young, journalists involved said they’ve already begun to see a change in morale among those involved. Some, like organizers at the L.A. Times, have even begun to hold remote office hours for journalists around the country interested in organizing their own unions. The response, several organizers tweeted earlier this year, has been overwhelming.